The Corvettes Doo Wop Revue is dedicated to preserving and performing the greatest music ever made – the music of the 1950’s Doo Wop era. From New Hampshire to New Orleans and Virginia to Vegas, The Corvettes perform the great music of the Doo Wop era with a fresh new energy. Their incredibly entertaining show and comical stage antics have left many a happy audience screaming for more! 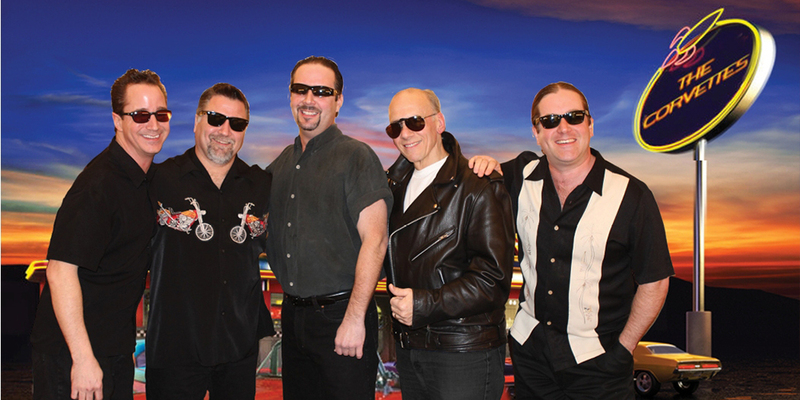 In the tradition of legendary Doo Wop revivalists Sha Na Na, every Corvettes show is more than a concert – it’s an all out a Doo Wop Celebration! Some of the great hits you might expect to hear at a Corvettes Doo Wop Revue show: Come Go With Me – Little Darlin’ – Whole Lotta Shakin’ Goin’ On – At The Hop – The Twist – Earth Angel – Sea Crusie – Rock Around The Clock – In The Still Of The Night – Runaround Sue – Runaway – Palisades Park – Twistin’ The Night Away – Splish Splash – Shake Rattle & Roll And many more!